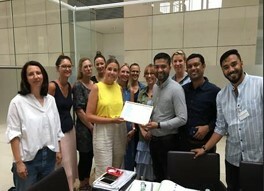 The award was handed over by Ms. Anne Feldkamp (Head of Global Buying, ESPRIT) to Mr. Jafour Hossen (Head of Marketing, SQ Celsius Ltd) on 17th July 2018 at ESPRIT Headquarter, Germany. SQ has risen its ranking remarkably from 64th to top 10 through the last fiscal year (Review period Dec 2017 – May 2018). Thus, SQ’s improved performance has been well appreciated by the ESPRIT buying team. We are extremely proud of this significant success and our heartiest congratulations to the team! We all should keep up this good work to make SQ stand tall!